Today is the opening day of the Twelve by Twelve exhibit at the Australasian Quilt Convention and Expo in Melbourne, Australia! 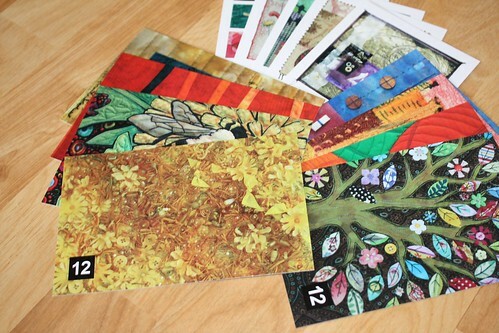 My fellow Twelves Brenda and Kirsty will be there with our quilts on display and these delicious postcards to sell. I did the design work on these, which wasn’t hard given the wonderful images we had to start with. Brenda chose a printer Down Under that did a very professional job. The cards have a lovely satin finish, a nice weight and show off our images beautifully. Right now the cards are only available at our exhibits in Australia, but who knows what the future will bring. Don’t forget to check our blog on May first for our Kilauea reveal. 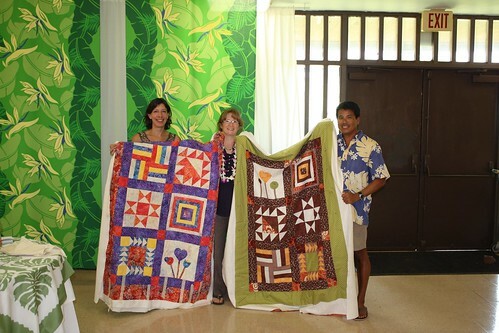 And, after May 2nd, our first 12 quilts move on to several more exhibits in Australia and New Zealand. Check the blog sidebar for dates and links. 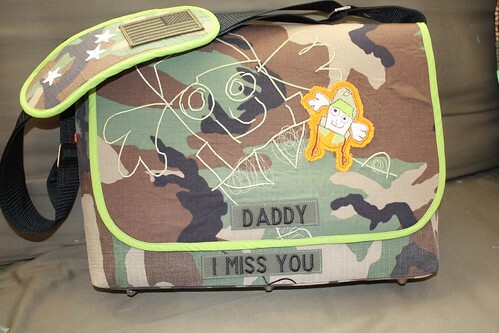 It started about four years ago with a drawing by my daughter of her daddy. 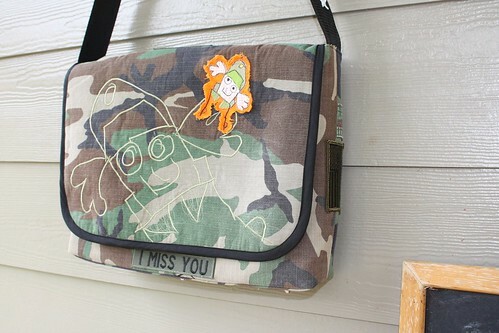 I thought he looked military (which may or may not have been intentional on her part) and needed to become a patch on a messenger bag. About a year ago, I found the perfect pattern and went so far as to make custom fabric using my kids’ drawings. 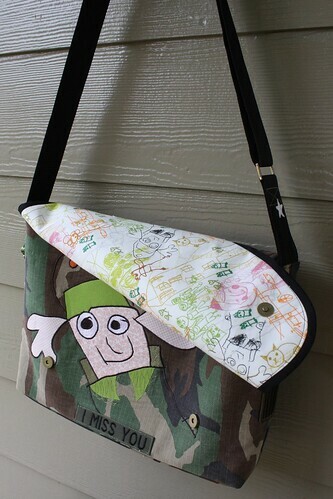 Last November I finally got around to making the bag, but I wasn’t happy with some of the choices I had made — namely stiff Peltex/Timtex instead of fusible batting as called for in the pattern (that will teach me). So, I took it apart. And so it sat for the last four months, taunting me with it’s un-finishedness, taking up space on the futon in my guest room/sewing studio. It really bugged me to have to keep moving it’s pile around whenever guests came to visit. But I was mad at it for not being perfectly crafted. To the bag’s credit, it came apart easily and was mostly salvageable. But I was still mad at it. Finally, I jumped in and finished it a few days ago. 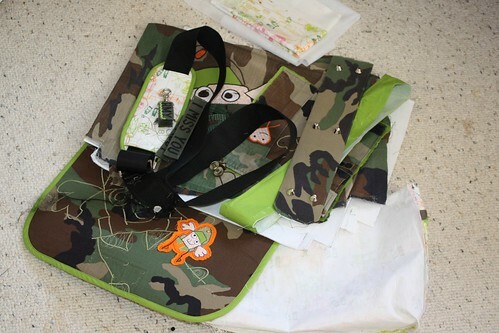 I used black binding which worked better than the green, and the softer batting in the body of the bag made all the difference in terms of maneuverability for sewing. But, once again, I did not heed the warning on the pattern, and I accidentally ironed the strap — making black smudges on the green facing in my lining. And though the black topstitching looks good on the outside of the bag, I don’t like it on the interior, especially as there is under-stitching as well and a couple of hiccups where the thread broke. 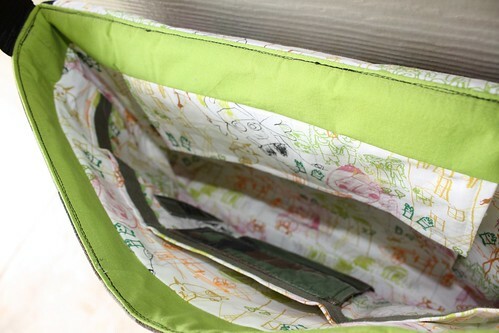 It would not be a huge project to take out the interior, replace the green strip and re-sew it all. But, I’m kind of over this project for a while. I am a huge fan of Wanda of Exuberant Color. She is the most prolific quilter I have run across and she’s absolutely fearless when it comes to mixing fabrics. I may have mentioned here that I love zig zag quilts. It is also no secret that I love fabrics from Kaffe Fasset. So, imagine my excitement when Wanda started a zig zag charm (meaning no fabric is used more than once) quilt with 308 Kaffe Fasset prints! Sure, I could make a zig zag quilt (indeed, I’ve made two) myself, but my Kaffe collection pales in comparison to Wanda’s and she’s got a way with fabric. No, I just HAD to have hers so I asked if she’d consider selling it. The quilt top now lives with me. 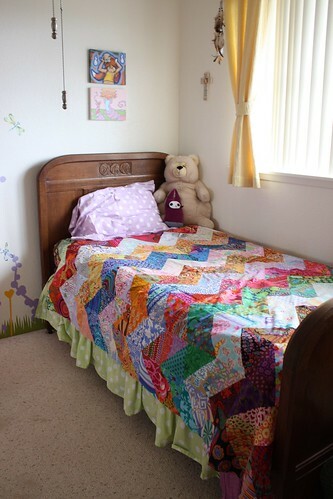 I had originally thought it would be a couch quilt, but it really looks good in my daughter’s room, adding to the bohemian flavor she’s developing in her personal style. Now I just need to find the time to quilt it. We will be attending my mother in law’s wedding this summer and I think the kids will have parts in the ceremony. Though the wedding will be pretty casual, the couple have said that “their color” is purple. A few months ago, I found a nice aloha shirt for my son and matching dress for my daughter in taupe and lavender. I didn’t buy them at the time though because the kids weren’t with me and I wasn’t sure of MIL’s plans. We finally went back to the shop last Sunday, and it was gone! We continued on to the big mall but after five or six stores, we hadn’t really found what we were looking for. Finally, it dawned on me that I could easily sew something. So, off to the fabric store (the link is a different store, but the same chain) we went. We found a lovely purply print for my daughter, but my son preferred an ochre one. Luckily, they share the same colors, just in inverse ratios, so I went with it. 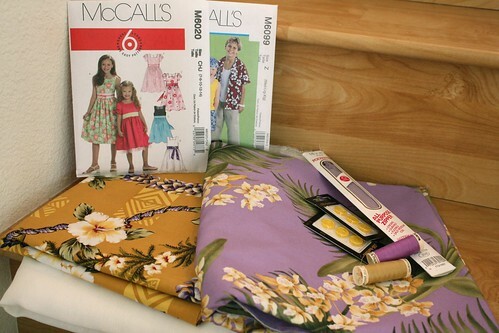 My daughter wanted more of a party dress than a mu’u mu’u, so McCall’s 6020 is what we ended up with. The sash will be in the ochre fabric of her brother’s shirt. He was getting frustrated with me because I wouldn’t let him get any of the black and gold buttons he liked (they looked like they belonged on a Chanel knock-off). Though I had something more rustic in mind, we compromised on the yellow buttons. Now I need to get sewing. Knowing that my students were making a wonderful meal for me, I wanted to give them something as well. 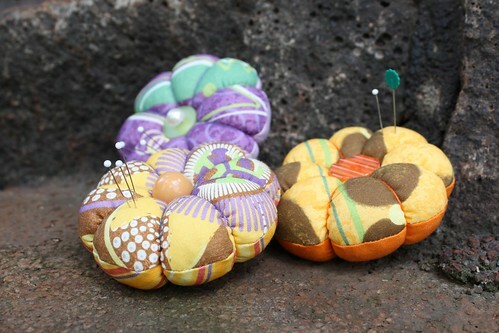 I figured pin cushions would be an appropriate gift for students of patchwork. Besides, there had been some confusion over whose box of pins was whose during class, so custom pin cushions would be practical as well! I used more of the fabric I designed myself; taro for purple lover Amber, brown lilikoi and stripes for bohemian Julia, and kukui nuts for our guy Jason. Simple to make, and no more mixed up pins. No, this isn’t a quilt. I’ve been teaching a beginning patchwork class at my local park and have had three enthusiastic students. With such a small group, we really got to know each other and it became more of a cultural exchange (two locals, one Costa Rican, and me, the gringo haole from Germany) and chat group. After our last class, my students wanted to take me to lunch. I said a pot luck was fine, and so I got a mini-luau! The first photo is the fabulous flower arrangement (which I got to take home!) and a bowl of poi, the staple starch of the Hawaiian diet. The second photo is some of my favorite foods. In back is shoyu chicken. It’s chicken simmered in soy sauce (known here by it’s Japanese name, shoyu), ginger, wine, and a little sugar. 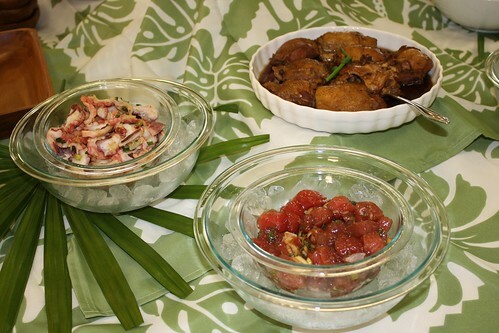 The front two are poke (pronounced “po-kay”) which is fish, seasoning and often a little seaweed. Usually it is raw like the ahi (tuna) front and center, but in the case of the “tako” (octopus: again the japanese name) the meat has been cooked. These are tasty over rice or all by themselves. Sushi and sashimi lovers would have little problem with poke. Student and park director Jason set us a table that looked like it belonged in a banquet hall or wedding reception. On the plate is more delicious and interesting food. 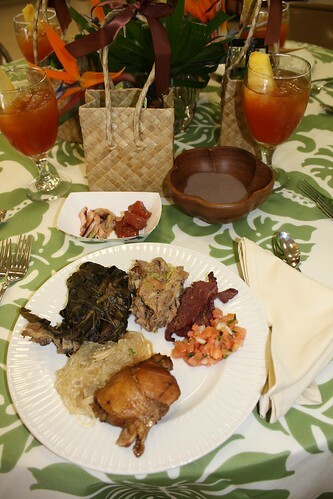 Center top is famous kalua pork and cabbage. You can’t go wrong with this slow cooked (usually underground in a pit) pulled pork. Clockwise is pipikaula which tasted a lot like corned beef, or a wet beef jerky. 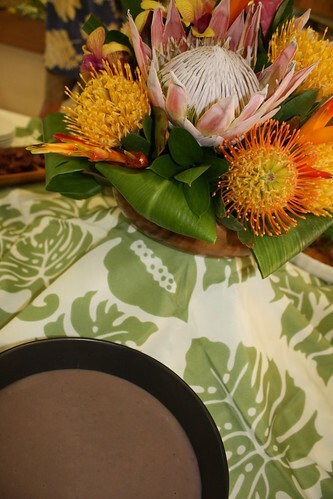 It is perfect for dipping in the poi. Lomi salmon comes next. If you like salsa fresca or cevice, you’d like this chopped onion. tomato and salted salmon dish. Fresh and tasty! My lunch companions mixed their lomi salmon into their poi, and while this greatly improves the poi, I personally think it does a disservice to the lomi salmon. Center front is shoyu chicken, and to the left is chicken long rice (chicken, broth and rice noodles). Lastly is the laulau. Frankly this dish scared me when I first heard about it. It is salt, pork, pork fat, and butterfish wrapped in taro leaves, then wrapped in ti leaves and steamed until tender. The combination just sounds wrong to me, but enough people told me they love it to make me curious. Actually, it’s quite edible. Teh leaves taste a lot like spinach, which is delicious with teh pork or fish. The pork and fish together is a little weird, but not nearly as odd as I expected, and it doesn’t taste fatty at all — just moist, and quite salty. Our guests arrived the day before Easter, so I felt like I should do a little something for all the kids. 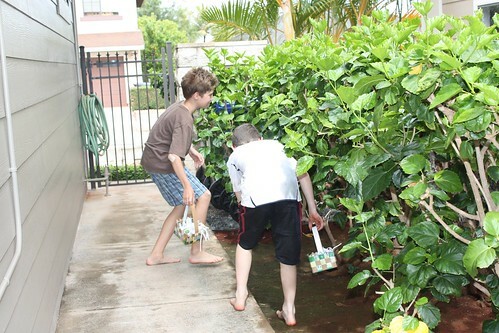 My kids and I dyed a dozen eggs (nothing fancy, just basic dunking in basic colors) so we could have a hunt in the yard. I made one that match so perfectly the hibiscus leaves that it took the kids four tries to find it. I also made four baskets, though I didn’t bother to photograph them when they were fresh and full. The baskets are woven from cardboard boxes (for four baskets: a lego box, a six pack, a cereal box, a box of Borax, and a case of soda). 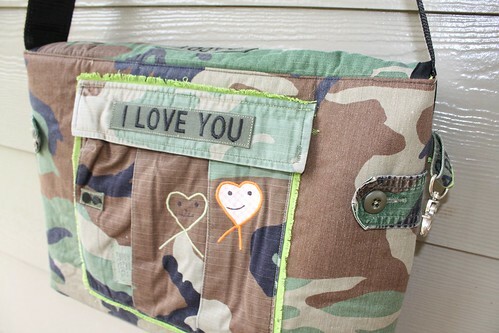 I found instructions/inspiration on Craft Stylish. 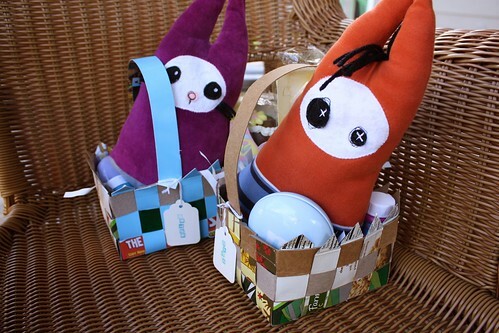 I filled the baskets with shredded paper, a cute tin of M&Ms, Peeps, a blown egg filled with confetti (THAT was fun! ), and some japanese biscuits with cute packaging. Each kid got a bunny monster of my own design as well. The two girls got cute purple ones made from leftover purple stretch velvet, and the boys got slightly zombie-esque ones made from outgrown T-shirts. The bunnies are soft and squishy and were very well received — which sort of surprised me considering the recipients are tweens! Phew, there’s been a lot going on here since I last posted. Mostly, it’s been of the guesty/touristy type with lots of family pictures, and thus not too blog-worthy. I’ve managed a few small crafty projects. We hiked to the top of Diamond Head crater, saw a honu (green sea turtle) up close on the beach, hunted for easter eggs, went to the zoo, splashed in the surf at Waikiki. 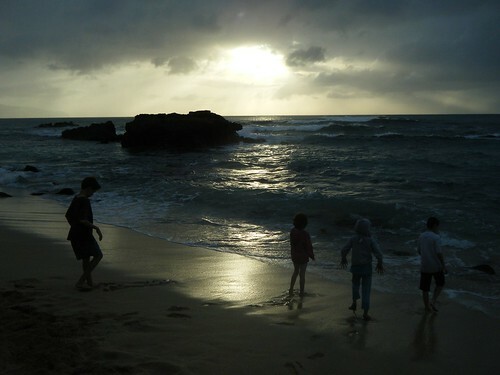 Our guests went to The Big Island and swam with dolphins, visited the volcano, and went to The Place of Refuge. Back on Oahu, I met blogger Bitter Betty and added to the scope of my shave ice experiences. Our guests returned and went to Pearl Harbor and checked out the Mighty Mo, we all went snorkeling at Hanauma Bay, they went to the Polynesian Cultural Center, and we walked around the botanical gardens at Waimea Valley, ate shave ice, and went to Germaine’s Luau to see my dance teacher perform, plus we played hooky at the beach and tried boogie boarding and then buried all the kids in the sand. I may do some retroactive posts of our activities. Then again, I may just move forward and you’ll have to take my word for it that we had a great time!